Craig Sako works the far end of Lake Wilson. From a small boat, he fishes the shallows along the banks, orchestrating one elaborate cast after another. His rod is a simple bamboo pole with a line tied to the tip, like a child might use, but he works the line with a graceful flourish. This is clearly no ordinary fly-fisherman. Sako, a chef at the Halekulani Hotel, is one of a cadre of Hawai‘i anglers who practice the Japanese art of tenkara (literally, “from the skies”). This elegant form of fly-fishing developed at least 200 years ago in Honshu and Hokkaido, where the lithe poles and short lines made it possible to cast along narrow, wooded streams. In Japan, tenkara remains an art form, like haiku or ikebana. During the Edo period, when weapons were forbidden to samurai, warriors practiced tenkara; balancing on rocks while precision casting was a useful substitute for training with swords. 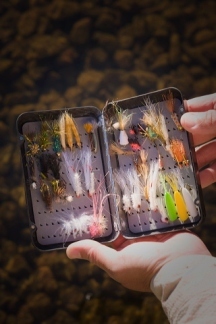 To many contemporary aficionados, the charm of tenkara lies in these cultural ties. While tenkara has become something of a craze on the Mainland, where its archaic simplicity is an antidote to the gear mania of Western fly-fishing, it’s just catching on in Hawai‘i. Sako began practicing the art while working in Japan; a friend there took him fly fishing, and he quickly saw that tenkara would let him get into places that regular fly-fishing wouldn’t. “I went right from the stream to the sporting goods store,” he says. When he returned to Hawai‘i, he brought tenkara with him. Sometimes he goes after peacock bass and red devil in Lake Wilson or smallmouth bass in the riffles of Nu‘uanu Stream. Although Hawai‘i is no freshwater fishing Mecca, Sako believes tenkara is still a useful skill. “It has a place in every fisherman’s quiver,” he says.